In a view to make the already complicated labor laws work in harmony for a business setup, PM Modi announced some transformational labor reforms. After ensuing some crucial changes in the fields of education, infrastructure, cleanliness, taxation etc, the labor sector seems to be the next best field to foray into. To enable his visionary scheme “Make in India” strike the right chords, he emphasized the importance of the new labor reforms. To put an end to issues of harassment by government officials or “inspector raj”, Modi illustrated the steps being taken up in “Shramev jayate”. To see that the government officials are doing their duty righteously, there will be periodic inspections. A randomly generated computer list will help select the inspection centers including emergency lists for inspection in serious cases. This teacher’s day, in an interaction with the students Modi had hinted at introducing Skill developments at urban and rural levels. Under the same scheme he unveiled Apprenticeship Protsahan Yojana, he focused on helping as many as one lakh apprentices by the end of 2017. Believing that the manpower in India is highly potential, he promised that by 2020, India will be nurture as many skilled youth to make India the largest exporter of efficient labor. Modi emphasized on creating more jobs within India and supplying the world the best manpower. With “Make in India” finally hitting the mainstream, Modi wants to eradicate any kind of redundant labor laws and practices to fuel up the industry setting process. To make that happen, From Oct 17th,2014, one labor compliance of 16 labor laws has kicked off. With the single window scheme, the central ministry has all the data of companies that fall under the central labor laws. Each business unit will be allotted a specific number to process a unified labor law return. According to Labor Minister, Narendra Singh Tomar, this scheme is sure to boost the economy and ease in governance will help in effective management of business setups. With a UAC number, a person can have his PF number linked with his Aadhar card, bank account number and will remain with him forever until he remains active in his career. Rs. 27,000 crore is the unclaimed amount in inoperative accounts. Tomar also pointed out that The Factories Act, 1948, Apprentices Act, 1961 and Labor Laws Act, 1988 are being amended to suit the present business systems. 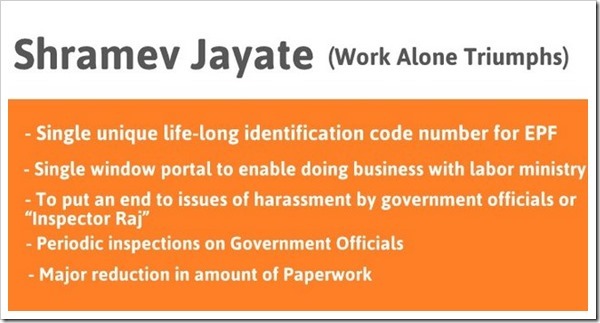 Not only is “Shramev Jayate” named appropriately, the new changes are quite a head turner. earlier governments turned a blind eye to the existing redundant laws, but the step of amending these laws will prove to be a major improvement in governance. By making everything easily trackable by a UAC number, sure the e-governance move is a move that the masses will like Modi for! Modi’s new labor reforms are definitely praiseworthy. Ola Brings Traditional Kaali-Peeli Cab Bookings To Mobile! Much awaited labor reform. It surely will enhance the new manufacturing setup time and reduce the ambiguity and confusion.